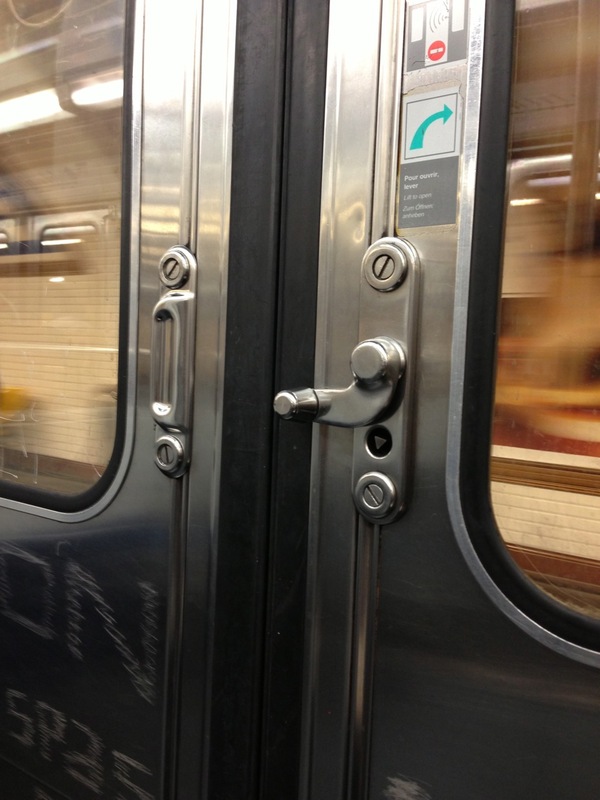 Riding the Paris Metro is a fun, safe, easy and efficient way to get around Paris. 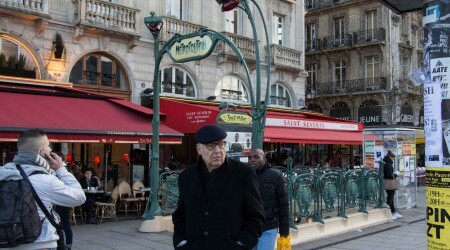 It also allows you to see Parisians going about their daily business. You will probably encounter some buskers along the way belting out Le Vie en Rose. Often I see people bewildered and lost, pouring over maps, arguing or getting frustrated. It is not that bewildering, as long as you know how. This is pretty dry reading, but hey, not even IKEA have come up with a way of making step by step instructions funky! 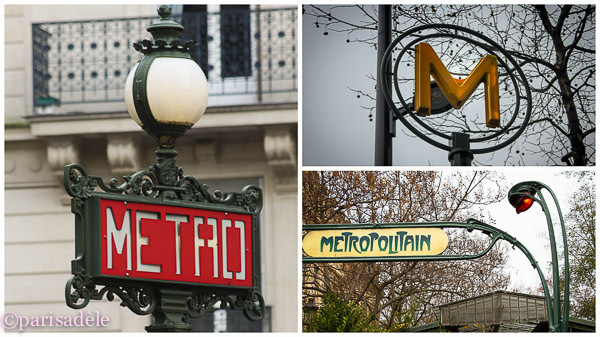 Metro Stations are identified by a big yellow M or more commonly, a white on red METRO sign or the beautiful, Hector Guimard designed art nouveau entrances with green on yellow METROPOLITAN. There are 16 numbered and colour coded lines. When you are searching for your platform, follow the signs by the colour of the line, the line number and the line destination. I will explain in more detail further down. I am going to take you through it, so you can catch the metro and look like a local. The first train leaves its terminus at 5.30am and the last train arrives at its destination around 1am. Weekdays 5.30am-12.30am and 1.30am on weekends. 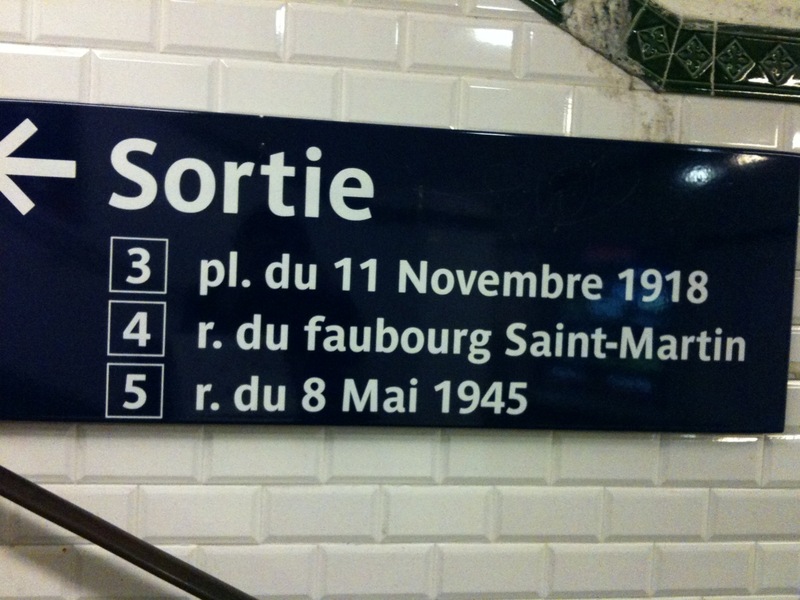 Metro tickets can also be used on the buses, tramways and the Funiculaire (automatic light-rail) up to Montmartre. A single ticket is valid for 1½ hours, within the metro system and on buses but if unvalidated, will last indefinitely. 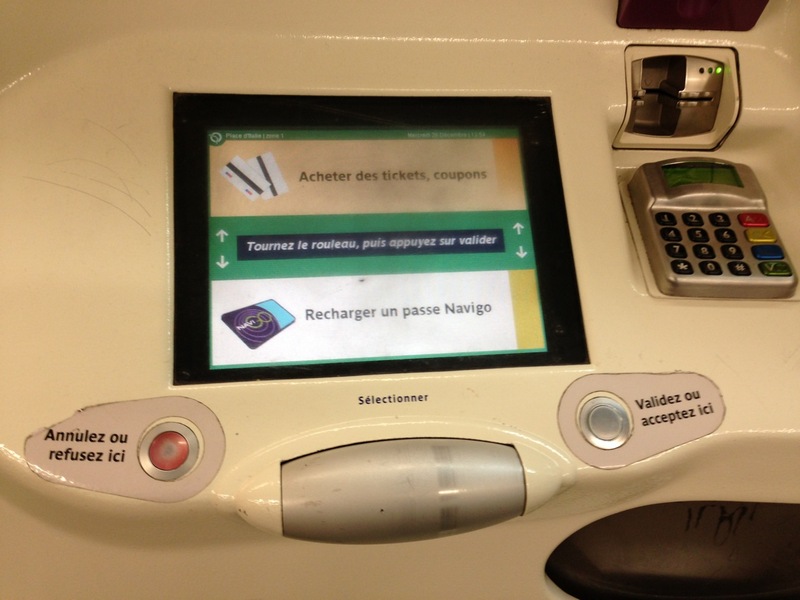 A ‘CARNET’ (car-nay) is 10 single tickets or in French, billets (bee-ay) and the easiest and flexible tickets to buy. You won’t have to mess around buying tickets each time you use the train or bus and wasting valuable time and you are not restricted to particular days of the week or month limits. It is also cheaper buying a carnet than a single ticket each time. A Single Ticket costs €1.80. A carnet of 10 single tickets costs €14.10. Therefore a saving of 3.90 euros. This Smart Card enables limitless travel with its weekly re-charge from Monday – Sunday or its monthly from the first of the month to the end of the month but it is not always convenient if you arrive mid-week or mid-month. You will have to do the math. There is a once off fee of 5.00 euros. You will need to bring a slightly smaller than passport sized photograph of yourself. If you are a regular visitor to Paris or intend to visit again, the smart card can be re-charged and used again for a number of years. Offering zones 1- 5 for either weekly travel, beginning from Monday to Sunday or monthly travel, starting with the 1st of the month to the end of the month. Zones 1-5 for a week pass €21.25 and for Zones 1-5 for a monthly pass €70.00. You are required to buy these from a counter and present a 30 x 25mm photograph of yourself to attach to the card. A once off cost of €5.00 for the card and can then be topped up, going forward. Zone 1- 5 – 16.60 euros includes Versailles, Disney and Fontainebleau but please do the math. Unlimited trips for the one day it is used. Wider zones can be purchased but not necessary if you are staying within the Paris perimeter. The carnet is the most flexible and inexpensive option in my opinion. Some days you may not use public transport at all and spend your time walking. Paris is only 10 kms wide and the best way to see it is on foot. 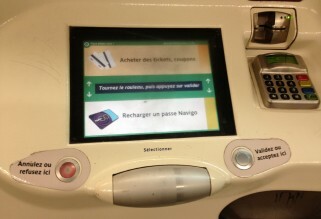 Single, a Carnet of tickets and re-charging Navigo Decouverte passes can be obtained at a green coloured machine in the underground or at the ticket counter, however they are not always manned and not all attendants speak English. 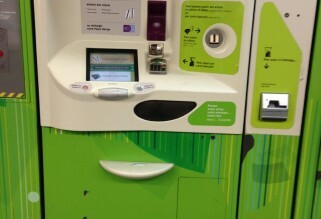 You can use notes, coins or debit/credit cards, depending on the machine and providing you have a chip style card. It is often wise to ensure you have enough coins. 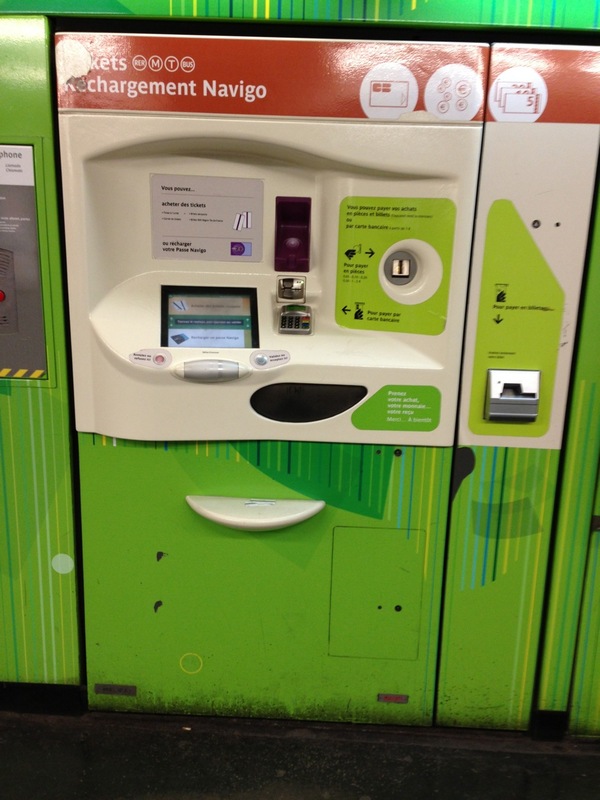 Some machines are dedicated for re-charging Navigo cards. The newer machines have several languages but not all. Some machines have touch screen but most have a large silver sausage shaped scroll device below the screen. Glide your fingers on this and you will notice it scroll up and down the screen. Either side of the scroll device are yes (green) and no (red) buttons. The next screen will ask you how many ‘carnets’ you want. 1 or 2. 1 will buy you 10 single tickets and 2 will buy you 20 single tickets. 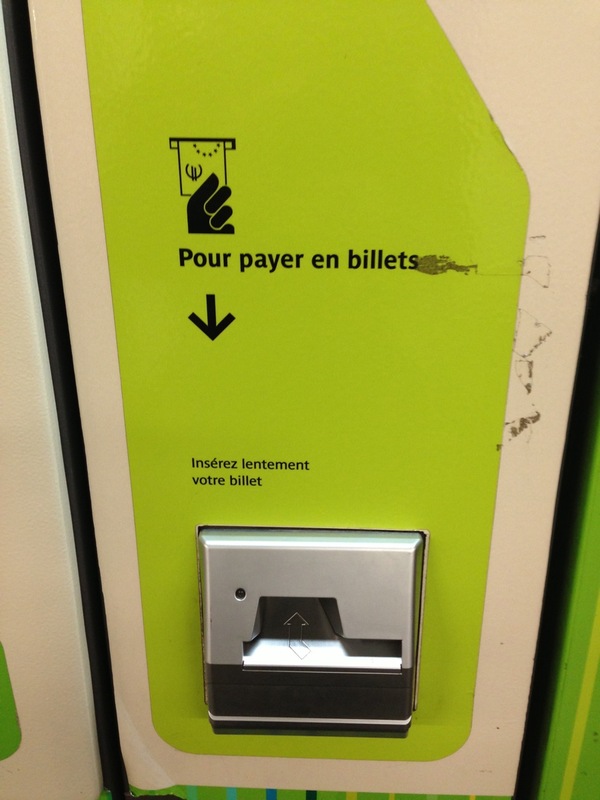 Next it will tell you how much you need to put in the machine and you will see money and card symbols come up. The image above shows where you insert notes. 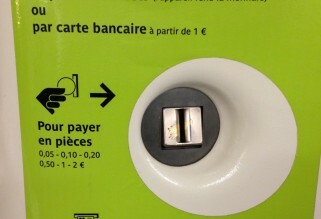 Note the euro symbol, the sign says, to put the notes in slowly. 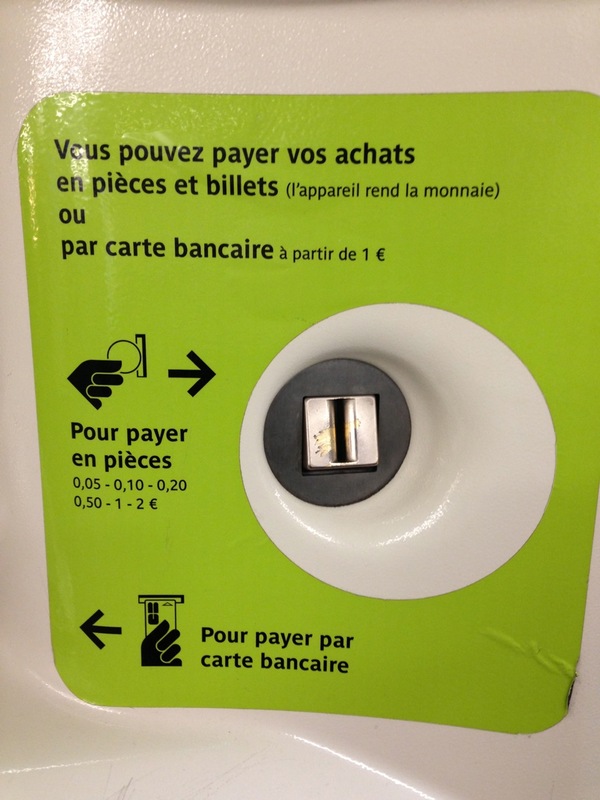 Image above shows the coin slot and credit card slot (carte bancaire) and what denominations it takes. Your tickets will be dispensed in the tray below. 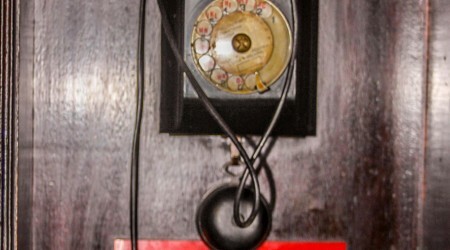 If you have a problem, there is a red button with a speaker, where you can ask for help. Once you have your ticket, proceed to the turnstiles. 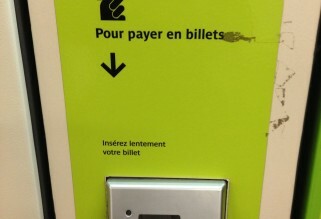 Slip the ticket in the slot, move towards the turnstile, wait for the ticket to pop out at the top, retrieve it, move through the turnstile and hang on to your ticket and don’t discard it until you have left the system. There are often inspectors checking tickets. If a red light appears, the card is past its use by time, or you have put an old card in or something is wrong. If you know it is a new card, go to the counter. Look for and follow the signs for your line colour, line number and line destination. 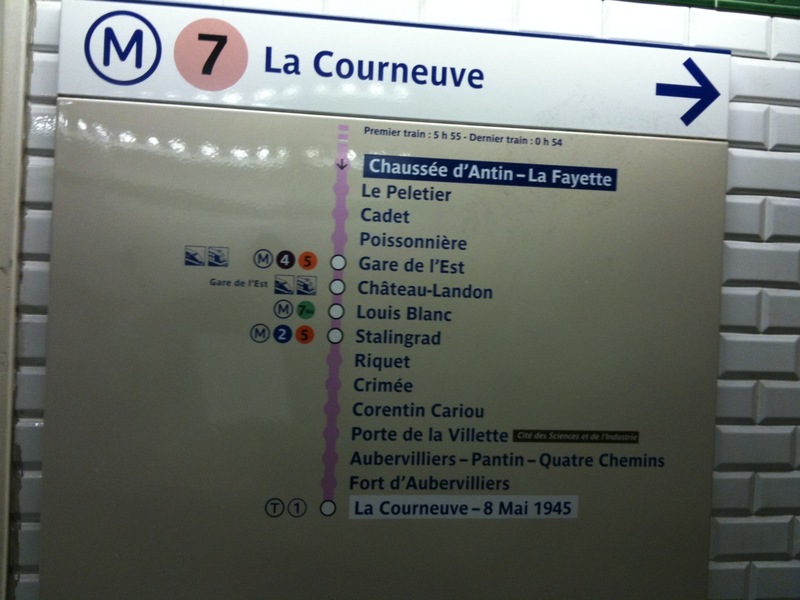 The line colour helps, but the line number and destination of your line will ensure you get the correct train. The destination of the line is important to remember, otherwise you might get on the right line but in the wrong direction. The image above is the type of signage you will see, to lead you in the direction of the appropriate platform. 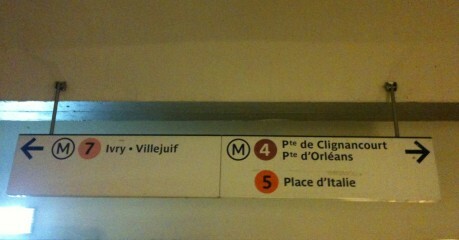 The left arrow: pink line, line 7, in the direction of Ivry*Villejuif. 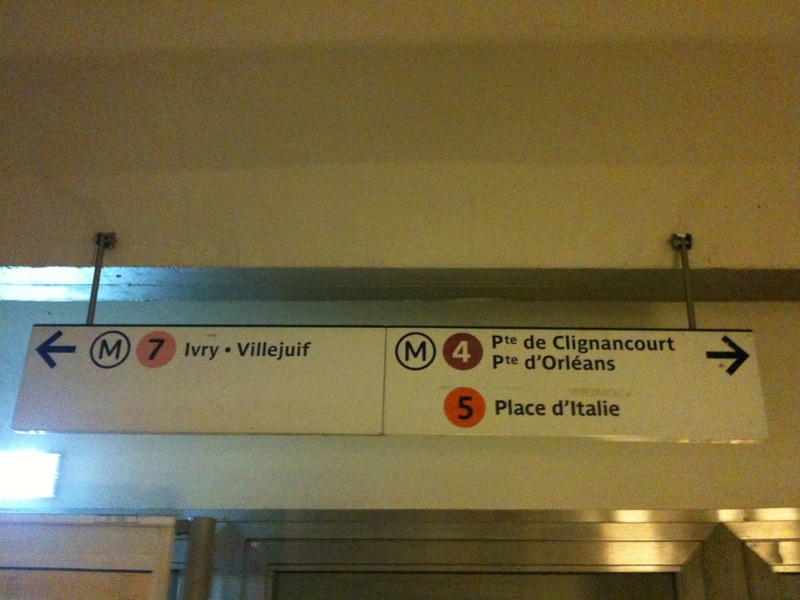 The right arrow: purple line, line 4 in directions of both Porte de Clignancourt & Porte de Orléans. This indicates you head this way for both destinations in either direction. As you move through the corridors, you will see separate signs indicating, one direction or the other. 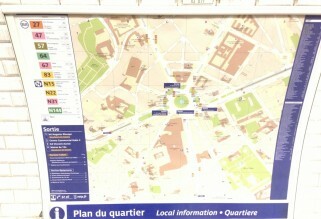 The above image also displays, the way to orange line, 5 in the direction of Place d’Italie. Before descending to your platform, you will find a sign indicating each stop on this line. Here you can double check, to see if your stop is listed here before proceeding to the platform. 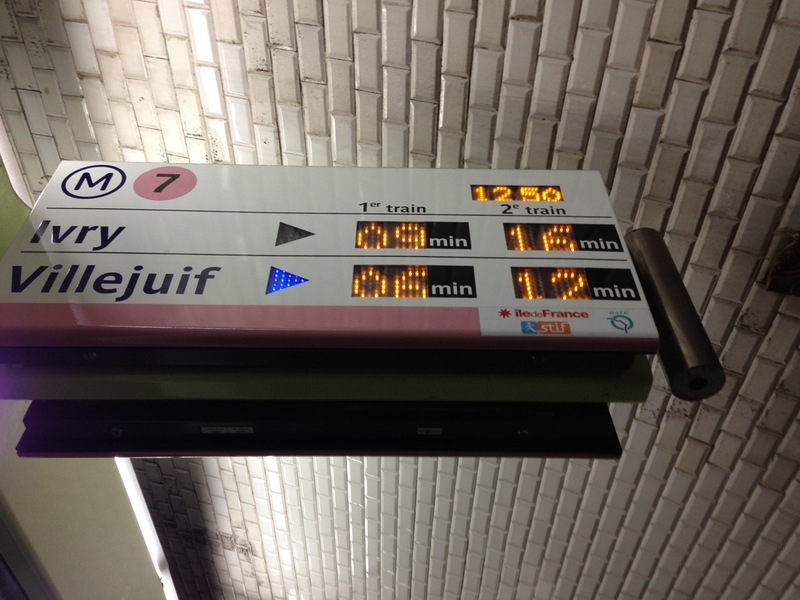 This is the type of signage you will see before descending to your platform, indicating : Direction, La Courneuve, Line number 7, Line colour Pink and the stations it will stop at. The circles indicate interchanges for connecting lines. This is always a good point to stop and note, if your stop is listed here, otherwise you are heading in the incorrect line direction. 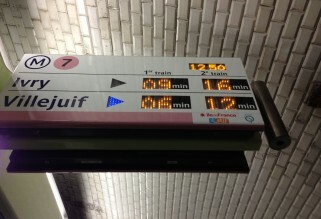 When you reach your platform, there will be a sign indicating how long the next train will be, noting the destination of the train line. There are three types of trains. Therefore, three types of door opening mechanisms. When the train comes to a halt you will hear an air release, this is a signal that the doors can be opened. 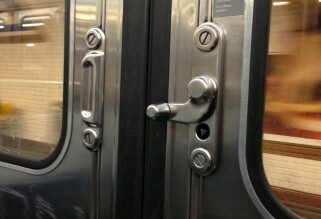 The newer trains have automatic opening and closing doors. The second type has a green button, once you hear the air release, press the button and the doors will fly open. The third has a handle, which you pull up, after the sound of the release and the doors will fling open. When you here a buzzer go off, the doors are about to close, so jump in quick! Upon disembarking, look for signs indicating your next destination line and which direction you move down the platform. This can be either up or down the platform. Repeat the process. Looking for Line Colour, Line Number and the Destination of the line. Most stations have a number of exits surfacing onto the surrounding streets or directly into department stores. Some exits will allow you to arrive at odd or even numbered sides of the street, some will bring you out onto different street corners. It is useful to know which street or intersection you would like to arrive at. This can save time, unnecessarily crossing busy intersections and gives you an opportunity to gain your bearings. When you alight the train, take your time to observe the multiple exit signs. Depending on your exit, may depend on which direction you move down the platform. They don’t always necessarily head in the same direction off the platform. When you find the exit of your choice, note if it also has a number. As you move through the corridors, you may be required to follow numbers, instead of street names. If the station has only one exit or you don’t care where you land, simply follow the SORTIE signs. After following the SORTIE, exit signs. Finally you will reach stainless steel doors, there are two types; automatic and manual. You either push the doors open or as you stand on the pad, the doors will automatically open. In the larger and newly renovated stations there will be turnstiles where you can simply walk through. Follow the crowds. Before leaving the station, look out for the very useful street maps. These will not only display the surrounding area, landmarks and where various exits will place you but will also show you in which direction the stairs land you above ground by the way of arrows on the stairs. This can be very useful, to aid you in which direction you want to move up or down the street and help you gain your bearings. Upon entering the train, near the doors, you will find pull down seats. Anyone can sit on these, however during peak hours, you are obliged to stand up and make room near the doorway. You may find yourself, up and down to allow people with shopping or suitcases, who need to get off, before the doors close. In the case of the elderly or pregnant, you are obliged to offer these seats. During peak hours, when the trains are packed, a simple ‘excusez-moi’ (x-queue-zay-mwa) will indicate to fellow commuters that you need to disembark or move down the carriage. Parisians avoid eye contact on trains and Parisians don’t talk loudly on trains, in fact, anywhere for that matter. Unless, perhaps you are on the last metro, late at night, when maybe they have had a few glasses of French wine, it can change. 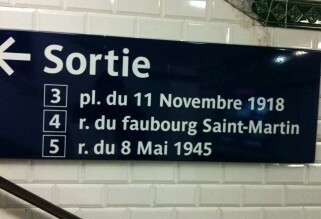 Be mindful, that not everyone using the metro is on holidays and Parisians are rushing to get to or from work. If you need to check a map or signs, stand to the side to allow them to pass. Nothing is more annoying to local commuters than tourists pouring over maps in the middle of the busy corridors and clogging up the system. 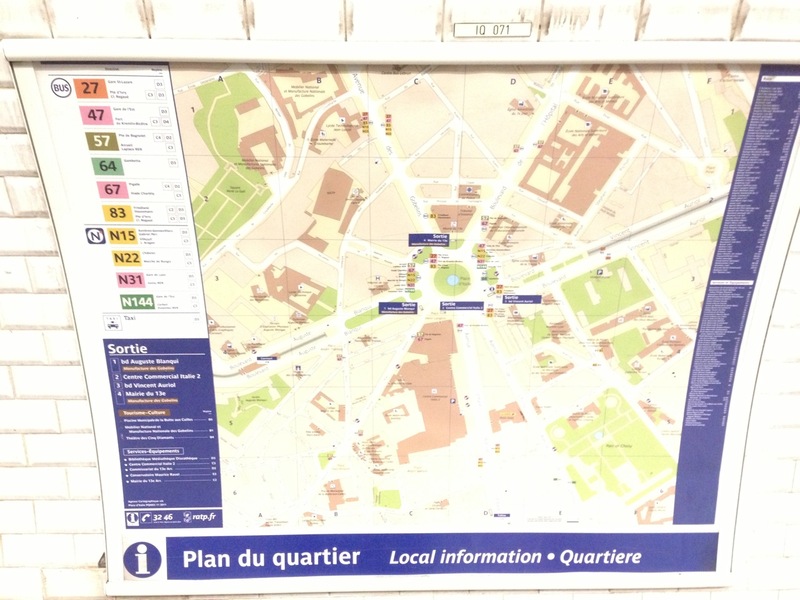 Although there are maps all around the metro stations and above each door on the trains, it is useful to carry a small pocket sized metro map in your pocket. These can be obtained, for free from the ticket counters. Ask for a plan de metro sil vous plait. (see-voo-play). Two sizes are available, large and small (grande and petite). Planning your metro journey is a good idea. If you have data for your smart phone, there are some great applications you can download but some (see below) can be used without data. Recently Citymapper (yellow link) has become my new favourite tool, working out bus and metro lines for me but you do need to have data – you can find more about them on the yellow link. I have been using the Metro Paris Subway by Presselite (yellow link) app for years and never use a paper metro map now and it is possible to use it without data! 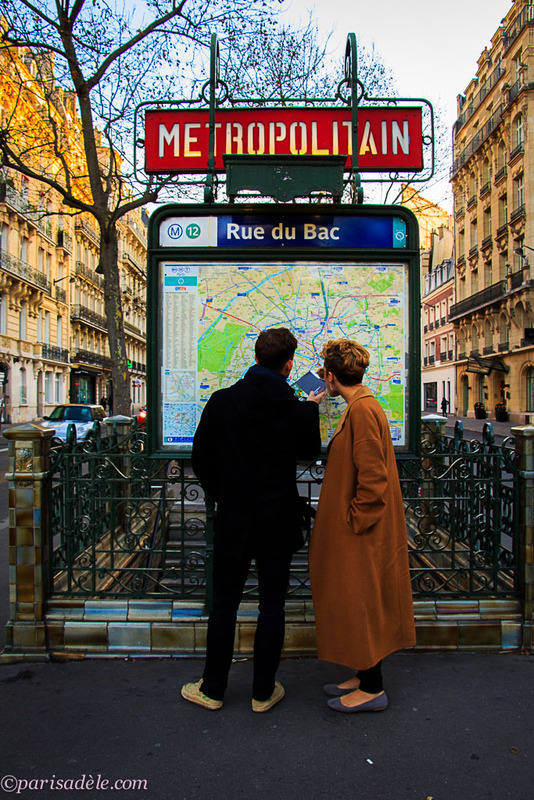 If you have data it will tell you where the nearest Metro stop is however if you are happy to find the station yourself and simply use it for the route planner, for .99 cents, it will be the best dollar you spend! If you have internet access where you are staying, the official RAPT interactive Metro Map can be a good tool. 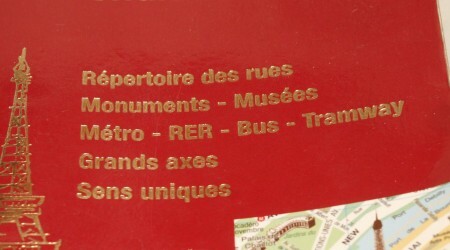 I found it invaluable before I discovered Metro Paris Subway. If you know where you want to go, before heading out for the day, this will plan the quickest route, tell you train changes required and how long the journey will take. TIP: When the site has worked out my route, I take a photo, with my iphone, of my computer screen. This way, there is no need to commit everything to memory and you have all the details on your phone. Below are the instructions on how to use it with a link to the official website in English, opening in a separate browser. If you need to access it again later, you will find it in the drop down box under Practical Information on my site. Click here to take you to the official site in English, it will open in a separate browser. Type in the Metro Station where you will begin your journey. A green circle will highlight the station. Click on the station. 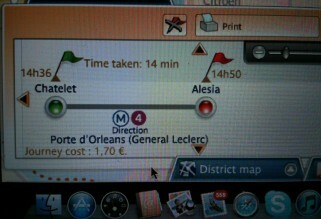 A box will come up with a red and green flag, click on the red flag, this will mark your destination point. The site will now work out your route. It will tell you the best station to leave from, the best destination name, the path you need to take, where to change and how many minutes the journey will be. It will look like this. 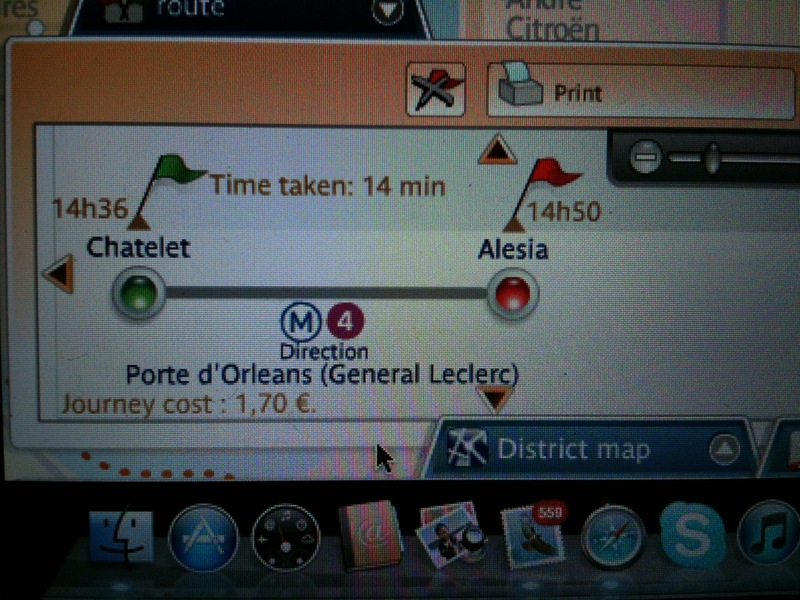 The above image is showing how to get from Chatelet to Alesia. Although I entered my start point Hotel de Ville, it recommends it is best to leave from Chatelet, as it is a direct route and I won’t need to change trains. 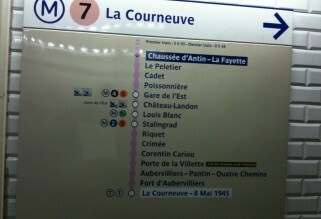 I need to take the Purple Line, Line Number 4, in the direction of Porte d’Orleans and it will take 14 minutes. 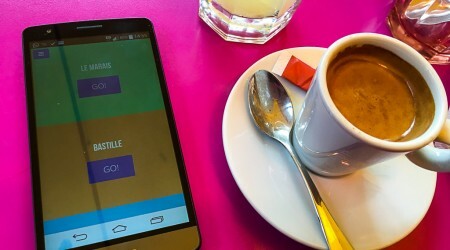 The site offers other features and functions and includes the bus system. Some metro stops are worth visiting, simply to admire the decoration. 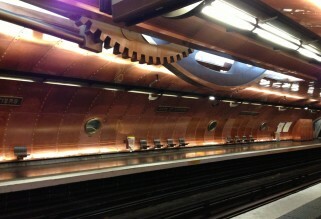 Arts & Metiers, with its copper lined walls and little portals, is a homage to Jules Vernes science fiction novels. 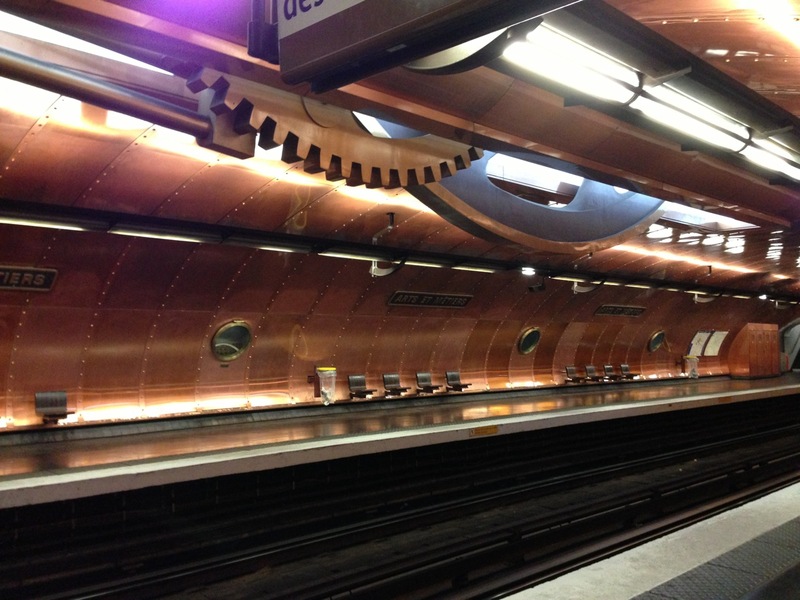 You can find more interesting metros under Paris Adèle’s Secrets. The main line, colour yellow, line # 1, is fully automated and driverless, it can be fun to sit up the front and watch the metro stations as you approach them and pass other driverless trains. You may encounter buskers, some good and some not so good. They often will tell you their story, of how life has led them to this. Some sing, some play guitar, accordion, some both, it is up to you if you want to contribute to their cause. You may also encounter some fabulous 15 piece bands, in the connecting tunnels of the metro, where they pull big crowds and sell their CD’s. Many homeless people sleep in the metro stations. They are not a danger to you, the stations provide a warm, safe place for them to sleep and instead of letting them die on the cold winter streets, the attendants turn a blind eye to them bedding down for the night. Crime is not rampant in Paris. However crowded trains can attract opportunistic pick-pockets. Keep your belongings tucked away in a safe place and not in back trouser pockets, open bags or easy to get at backpacks, where nimble fingers can relieve you or your belongings. Watch out for young children in particular. The police have recently caught an offender, who paid a large ring of child thieves, to steal for him. Please feel free to print this document. However be warned it is long! Although the door instructions are of use, when reading, you probably don’t need to print this and just print what you find relevant. If you feel I need to add more information please let me know, so I can help others. If you used my instructions and found it useful, please let me know that too – it is nice to know I have helped fellow travellers. Whatever you encounter during your metro journeys, whether you get lost or not, admire decorative stations and entrances, or come across lively buskers, I hope you enjoy your travels. If you have found this information useful, please thank me by following me on facebook where I post daily photos, updates and anecdotes. Clara, you are so very kind, thank you so much. It is so nice to hear feedback and to know that I have helped someone plan their trip to Paris. Merci Beaucoup. I will put this info to great use on my next visit to Paris. Really appreciate you taking the time to write this article and take the photos. Makes so much more sense when you can see the machines and signs that will be encountered in the metro. This is the most detailed and easy to understand information about the metro I have ever read. I am sure it was time consuming to organize but you have made the metro use a lot easier for many, may people. Hi Irene, thank you so much for your lovely feedback. You are right, it did take some thoughtful time to put it together but hopefully it has helped a few people. thanks again for taking the time to leave a comment, I really appreciate it. I have spent three days reading every page, sometimes twice !!! I am blown away by how well this site is constructed and how informative it is. From the ideas and suggestions I have read on this website, I have been able to start multiple searches I otherwise would have not even considered. My problem is now how do I cram all the options into my itinerary ?? This site feels like a mini-wikipedia on Paris. Thank you for all your hard work. thank you so much for taking the time to send this lovely message, I am honoured! A mini wiki page – ha ha how fabulous. Go Aussie and glad to be of help, I am so glad you have gained some tips.